Blogging about a more simple life in the country following a slightly hectic life in the suburbs. I'll be sharing stories about our life in the west, marriage, parenting, living with Type 1 Diabetes, recipes, homeschooling, crafts, repurposing and sewing projects, simplifying, saving money, God's work in our lives, and maybe even events from our past. Come along and join our journey. The bathroom isn't DONE, but it's done enough to share the 'almost finished' product. Here's our bathroom as it looked before last weekend when I decided to 'get busy' on this bathroom update. After doing the cabinets and countertop, I hit the walls with paint. This was a challenge due to the vaulted ceilings. Another view of the 'before! On that wall at the end next to the toilet is a black shelf. I didn't get it in any of the photos. I lugged the step stool and the ladder into the bathroom and got my paint ready to go. I had painted the lower halves of most of the walls prior to this point. Second coats were completed where needed.... then... I climbed the ladder and simply moved up the walls until I was standing on the rung next to the top to reach the peak of the ceilings. NOT. MY. FAVORITE. THING. TO. DO!! the green like the rest of the room. Doing a second coat was on my least favorite list of things to do, but... you do what'cha gotta do, right? The funniest site was probably me on a ladder that was half in and half out of the bathtub. The strange things one does for home improvement. While the walls dried, I used a hammered brown spray paint on all the hinges, handles, bath accessories, and light switch plate. 'hammered brown metal' hinges/handles etc. Looking into the bathroom from the hallway. (The back wall by the toilet it still 'wet paint'. Once the walls did dry I had to tackle the ladder again. I think it was half worse and half better the second time around. Worse b/c I felt like I was going to fall; better b/c it was easier to get the final coverage. 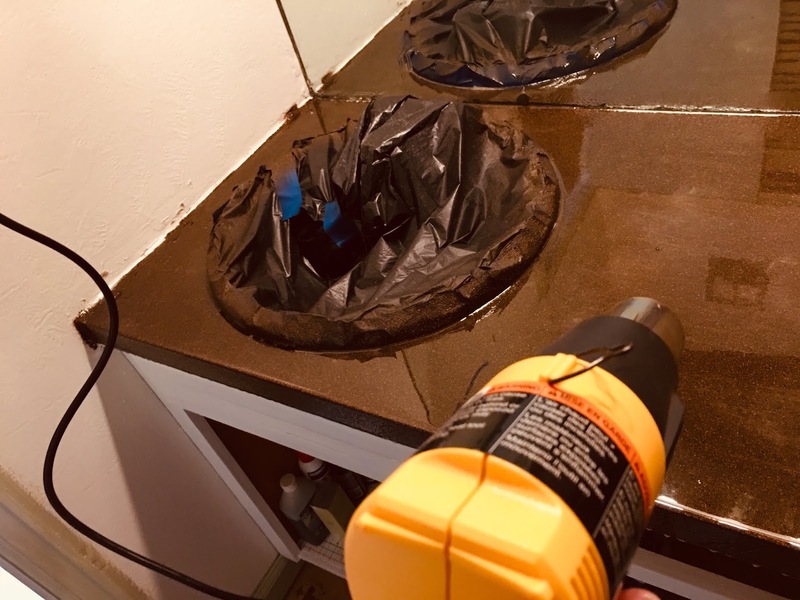 On Saturday morning I began reassembling the hinges, doors, handles, drawers, accessories, etc then began removing the plastic and painters tape around the sink. Let's just say that step could have gone better. Fortunately the caulk will cover the tape I couldn't get out of the resin. LOL! I also put the cabinet on the countertop and filled it. Another view looking into the bathroom. I then washed the tub and tile and re-washed the toilet b/c I had gotten quite a bit of paint on it in my various stages of remodel. I vacuumed the floors; put down the runners to keep the floors a bit warmer until we put down our flooring; then took a few pics. I still need to scorch the barn wood boards with a torch and stain them; then cut and hang them. Then I SHOULD take down the dated light fixture and paint it until it's replaced and do the same to the faucets. But.... at this point, the barn wood frame and flooring would make me So... SO.... HAPPY! Eventually I may also tackle painting the lovely yellow tile, but... again, for now... I"m thrilled with how it's turned out. It'll be nice that the girls can use their bathroom again too. Leave me a comment and tell me what you think. What would you add? Or change? What would you do to the faucets or the light fixture? Do you think it is it fine as is? The sinks/cabinets/countertop all 'finished' except for caulking around the sinks, wall, and mirror. And of course minus the barn wood frame around the mirror -- I really can't wait to see how that looks. A close up of the countertop/cabinets. It has been a LONG time since I've been active on my blog. Life is full of blessings and I find there's only so much time each day to get to things. Lately, my blog has not been top priority. I have to start off by saying I 'began' this project when I pulled up carpet -- yes CARPET - from this bathroom 1.5 -2 years ago because a) carpet in the bathroom just doesn't seem sanitary to me (maybe if I shampooed it constantly, but who has time or energy or ambition for THAT) and b) the girls aren't good at closing the shower curtain during showers therefore water was getting under the carpet and mold was growing. EWWWW! I have to say that I understand WHY the people who owned this house before my in-laws bought it put carpet in the bathroom. Basically because IT'S COLD!!! The trapdoor that goes to our crawlspace (which is just a dug out dirt hole in the ground for all intents and purposes) is smack dab in the center of this bathroom. Once I pulled that carpet up.... cold air just rushes in constantly. I get it... The carpet insulated the floor AND blocked all the air from seeping through. I'll need to come up with a solution to prevent that cold air blast moving forward. Sigh. So.... back to my story.... I pulled the carpet up and.... well..... left it. When I say 'left it', I literally mean, L-E-F-T..... I-T! I didn't pull up the tac strips; I left all the staples in the floor; bits of carpet were stuck under the toe boards etc. It. Was. A. Hot. Mess. Ya'll! Here's the LOVELy marbled-like laminate countertop that I wanted to 'change'. In Oct I started a weight loss beta program with my cousin AND I went through Mom Mastery Boot Camp. Between the two, my life was altered in MASSIVE ways -- in a GOOD way. I had energy from losing weight; I had motivation from the programs and my Bible studies; I decided to get up and get moving. I cleaned that bathroom -- floor to ceiling and everything in between. Here's the room all cleaned and the tac strips removed with our ugly sub-flooring showing in all it's glory. I then took doors off the cabinets, removed drawers, and sanded the countertop, cabinets, drawers, and doors. Door removed and sanded along w/the frame. Sanding the countertop and cabinets. I'm using the same colors in this bathroom that I have in the living room and kitchen/dining room so... perfect. I painted the base coat on all the drawers and doors. 2 coats. The doors on the table painted with the base coat. After that dried, I applied the antique glaze coat and wiped off to achieve the antiqued look I was after. and the protective top coat applied. Finally, after 24 hours of dry time I added the top protective coat. That part was easy. Time consuming b/c of all the steps but.... relatively easy. For the countertop - we didn't have it in the budget right now to purchase new countertops, but the 'white-marbled-laminate-look' we had going just didn't do it for me. After a little 'Pinterest' browsing and HomeTalk looking, I decided upon using Stone look spray paint covered with Envirotex Light Epoxy Resin. 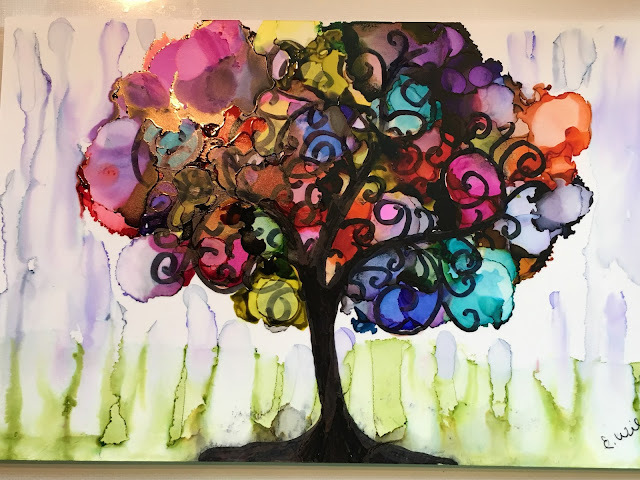 We had used resin on some of the girls' 4H projects so I was familiar with it but... this was much bigger than a small canvas or glass bead and window project. I taped off the mirror, walls, toilet, and lower cabinet with garbage bags and plastic tarps. I also covered the sinks and faucets COMPLETELY with bags and painters tape. Everything is set to go. Next I went to town with 'Stone' look spray paint. It was a 'different' look, but not really what I was going for. So glad a few more coats of paint made it more of what I envisioned. It took about 4 whole cans to cover the entire surface to my liking. The first can left TONS of 'white' showing through. The 2nd can didn't cover it much more and I was beginning to think that was the 'look' I was just going to have to live with. I didn't HATE it, but.... I didn't LOVE it either. After a day of drying I decided to try another coat (meaning can) of stone paint. It was beginning to fill in those 'white' spots and look more solid. I liked that better. Another 24 hours later and I did another can of stone paint. The look was much more to my liking. A trip (or 2 -- but that's a whole other post) to Fort Collins and I had my Envirotex Light Resin. A morning later and it was on the countertop. It wasn't a hard process, but frightening. You have to mix the stuff 'just right' or it may not fully harden. That'll be fun. Here's the countertop w/the resin as it's drying. I'm hoping it looks FABULOUS once it's dry. In addition, the resin 'drips' off the edge more than I expected AND it dripped a bit onto the cabinets. I wiped it off, but realized later when I put the antique glaze on the cabinet frames, that the stain 'adhered' to where the resin had been wiped off leaving odd looking streaks and smudges. Sigh. and to even out the thickness of the resin. I keep telling myself it's ok - it's better than it was before. I'm painting the walls sage green to match the rest of the house as well as the colors in the shower curtain. I've only done a couple walls and only up as far as I can reach without a ladder so far. I found a candle holder at the Goodwill with a bear, trees, and moose in a brown metal - it matches perfectly with the shower curtain and will be a fun 'top' to the new cabinet. It's all coming together, slowly. I'm also pondering the 'back wall' as you look into the bathroom. It has some 'damage' to the drywall and 'just painting' it may not look the greatest. I've researched a few options to make it look 'rustic' without too much cost, but.... I'm falling short finding the materials to put those ideas into action. Right now.... my top choice is to get a few rolls of self adhesive cork and put that partially up the wall. Guess we'll see as I move forward. In December, I discovered a new 'art form'. Amazing things happen when you do this! Unique patterns evolve as the alcohol burns off leaving unique and unusual patterns where the flame spreads. Sharpie colored tile after being 'fired'. Love how the colors simply merge and become their own design. No 2 alike. 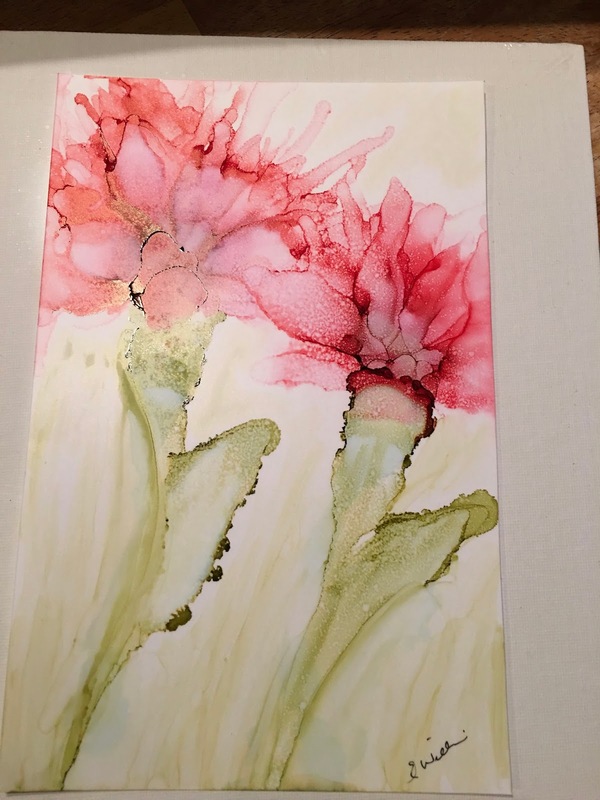 As I researched this new technique, I also realized that actual alcohol inks exist. Then I began watching YouTube videos and tutorials on how to use this new-to-me art medium. Let's just say..... it was a bit ADDICTIVE!!! A trip to Michael's was less than productive as I accidentally boutght India Inks instead of Alcohol inks. Not that the dye based India Inks aren't fun in their own right, but... they aren't the same thing. They react and move differently on their given substrates. Who knew, right? Alcohol inks need to be used on non-porous substrates - like tile, glass, metal, etc. whereas India Inks and Acrylic tend to be used on porous - canvas, art paper, and the like. You see, when using alcohol inks you want the ink to 'bloom'; expand and grow and move on it's own accord. Plus when you 'combine' alcohol inks' on the surface of your chosen substrate, they don't 'mingle and mix' creating new colors like other mediums. The alcohol in them actually 'reacts' and pushes the other ink out -- you then get a unique effect on 'both' colors instead of a brand new color. Not to mention, when adding alcohol, it can 'take away' the colors to some degree depending on the substrate being utilized. I think that's one of the big draws for me. It's 'organic' if you will. It's a bit unpredictable and you don't HAVE to be a skilled artist to utilize this fabulous art medium to produce stunning works of art. 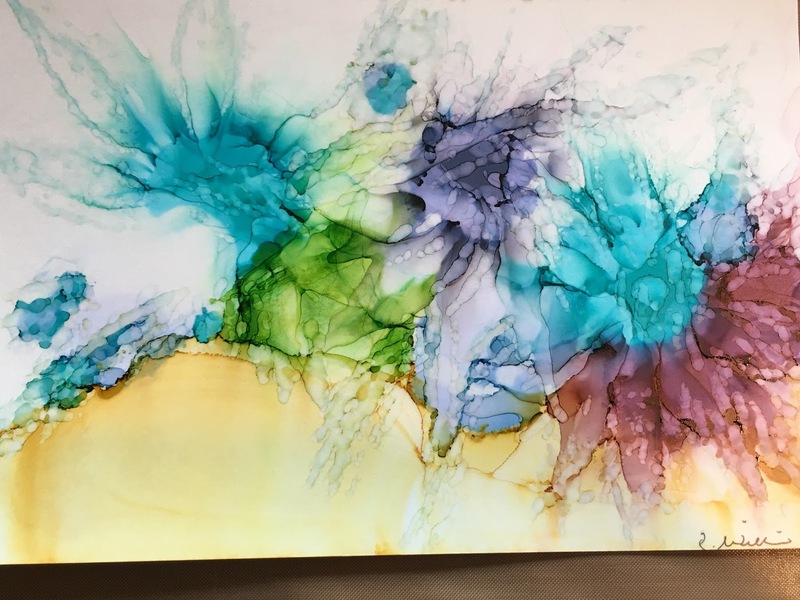 Albeit much of alcohol ink art is abstract - which I'm normally not a HUGE fan of, but in this medium??? I'm literally transfixed by them. It's just a different quality and appeal. 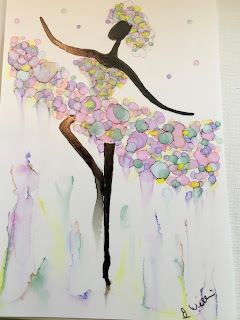 After discovering this wonderful medium, I purchased a Piñata Exciter Pack (a set of alcohol inks sold by Piñata - a great way to 'test the waters' in this fun art form) to get me started on a new art journey. 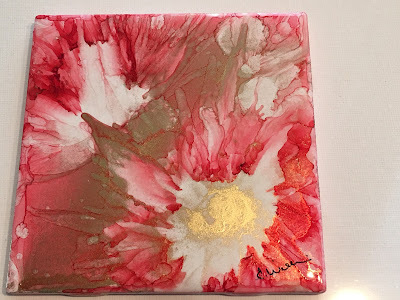 Not long after, I was scouring the internet watching YouTube videos, joining Alcohol Ink Communities on-line and.... learning. Tools of the trade include: (Note: You don't need all of these items, but they make working with the inks SO. MUCH. FUN!) Alcohol Inks (obviously); Alcohol Ink markers; an air compressor (I'm using Techno's from the garage - yes, big; bulky; loud, but... it does the trick); straws; canned air; brushes; a hair dryer; a heat gun; alcohol; pipettes; sharpie markers; gel pens for outlining; photo paper; tiles; glass; yupo or other non porous paper; metallic card stock; felt; cotton balls; q-tips; and any other 'fun' thing that may cause amazing reactions in the alcohol ink as it moves on the substrate. that are made as the alcohol 'pushes away' the inks as it invades. Initially I made 'coasters' by dropping the ink on tiles, adding alcohol to make 'circles'. It was cool watching the alcohol and ink interact and move and develop. I gave many away as gifts for Christmas. 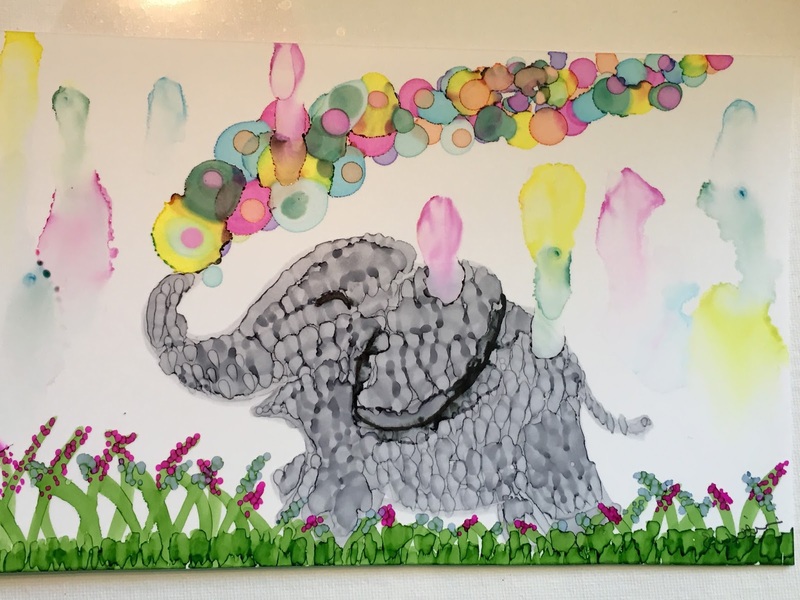 with a cotton ball to make bubbles and dots. A galaxy is born. Then I began tilting and moving the tiles about to make the inks 'blend' and create swirls, sweeps, and swatches. Or I used a cotton ball to 'dab' at the inks and alcohol as it mingled causing bubbles and dots to materialize out of the myriad of colors. 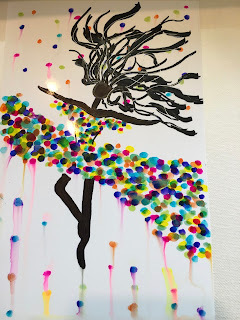 Combining drops of ink w/alcohol then adding fire -- what fun designs emerge. member of our community who is special to our family. Eventually I discovered you can use canned air, a straw, or an air compressor to make flowers and cool abstract designs. 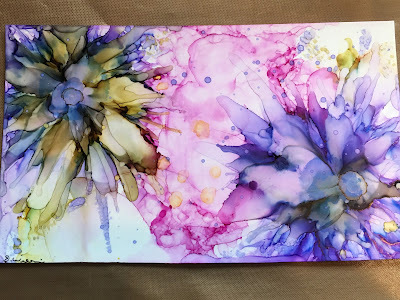 I think this is one of my favorite ways of using alcohol inks. adding small details with alcohol and brushes. It's relaxing and mesmerizing all at the same time. A small piece of metallic card stock. the inks along using blue and silver. This piece has actually sold. Not to mention CRAZY ADDICTING!!! As a result, I've decided to play my hand at selling the artwork I produce. This piece was made w/just blue ink and a heat gun. Green ink on tile blown with heat gun. Such an ethereal feel. Various ink colors dropped. Alcohol added. Then fired. More alcohol to get new effects. More fire. Amazing, unique results. More tiles made w/Sharpies, alcohol, and fire. market one-of-a-kind tiles for that very purpose. White flowers on a black tile. Our girls LOVE this pretty little girl. 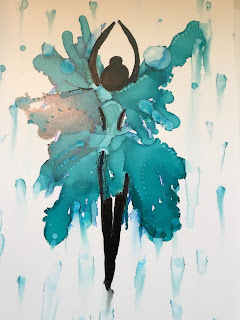 This blog post is a 'picture journey' of the evolution of my art. It includes a spattering of the 'inkings' I've done. Many of the pieces are available and are a demonstration of the styles of art I tend to 'ink'. If you are interested in any pieces, reach out and let me know. Also, follow my page to see what new techniques I learn and develop. Our girls are encouraging me to 'start a website' for my art. Who knows. Maybe I'll do just that. Keep an eye out for it. I may also make some prints and notecards of some of my pieces. Maybe 'series'. Like 'flowers'; dancers; trees; etc. It's so fun. 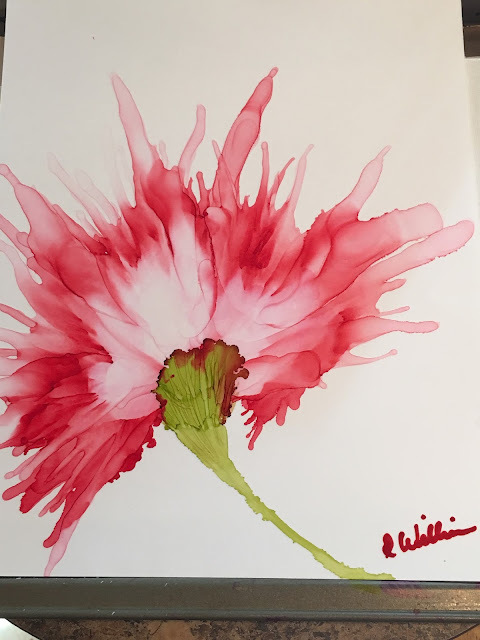 Join me on this artsy journey into alcohol inks. Purple flower on pink background. purple and black for the flower. Flowers were fascinating to 'cultivate'. I have a LONG way to go, but they are tons of fun to create. You can make so many different kinds of floral designs. Spikey; soft; bold; wispy - the possibilities seem endless. on top to make them 'pop'. I wanted to add 'definition' to this purple flower. I think I liked it better as a more abstract version. I like the softer, more rounded look of these purple flowers. This would make a pretty trivet. More 'ethereal' type floral-like pieces. Large purple and yellow blooms. A bit softer edges here. Probably my favorite flower to date. I may frame this for our walls. Black eyed susans or sunflowers. given it a more 'finished' appeal'. first successful pieces like this. So vibrate yet a bit ethereal. 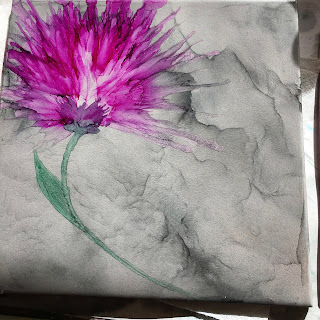 Florals on a tile - this will be a home decor piece that has already been spoken for. This is possibly one of y favorite pieces that showcases so many different techniques. Plus it's just so colorful and fun. One of my personal favorites in terms of abstract art. More abstract. What do you see? 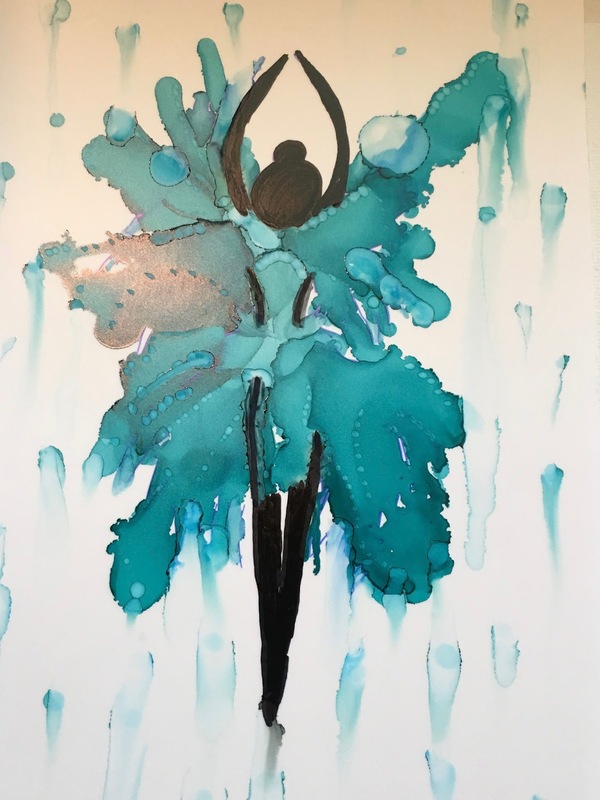 A peacock b/c Charity loves them and wants to make one. Another attempt. I like this one better. My 'whimsical pieces based off of printed picture templates. A whimsical tree - 2/2 so far in a series. There may be more. This little guy sold the day I posted him. Finally - my Dancer Series. 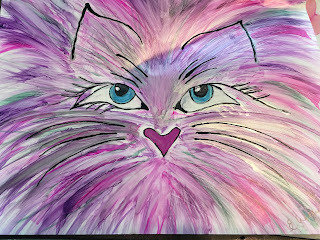 One has already sold; a request has been made for notecards of all 4; and the suggestion has been made to make prints to sell at a slightly lesser cost. Hmmmm..... the potential is astonishing. as she too sold the first day posted. I hope you'll continue to visit my blog to see what new creations I 'ink' and to follow my journey in this fun new endeavor I call a hobby.